When Dirk Johnson approached Alaska hunting guide Les Cobb at a trade show in Utah two years ago and inquired about a bear hunt, Cobb didn’t know what to say. Johnson was sitting in a wheelchair and Cobb had never worked with anyone in a wheelchair before, whether it was on a hunting trip or in any other facet of life. ”My first thought was I don’t want to deal with someone like this,” Cobb said. But the more Cobb and Johnson talked, the more Cobb got interested. Johnson seemed sincere and was willing to do whatever it took to make the hunt a reality. He told Cobb he had always dreamed of hunting in Alaska. Cobb agreed to give it a try. It took two years, but Johnson finally got his bear, a 6-foot black bear he shot from his wheelchair behind the cover of a ground blind in the woods north of Fairbanks a month ago. 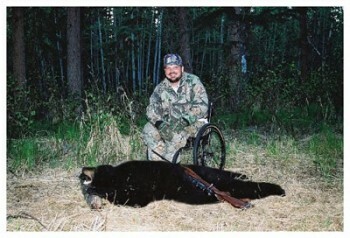 Johnson was one of two handicapped bear hunters Cobb guided this year, and both got bears. Before meeting Cobb, Johnson hadn’t had much luck finding guides willing to take handicapped hunters. ”There isn’t much out there for people in wheelchairs,” Johnson said. Johnson is paralyzed from the waist down as a result of a car accident nearly 20 years ago. He had been an avid hunter and fisherman before the accident, and worried that he would have to give up that part of his life. But with the help of technology such as four-wheelers and a heightened awareness concerning the handicapped population, Johnson has continued to hunt and fish. He goes after deer, elk, and waterfowl in Utah and has participated in a moose hunt as well. Society is becoming more aware of the needs of handicapped hunters and fishermen, Johnson said. There are fishing platforms for handicapped anglers on rivers, lakes, and reservoirs. Johnson hunts ducks from a wheelchair-accessible blind at Fish Springs National Wildlife Refuge in Utah. ”None of it would be possible without the support of people like Les Cobb who are willing to embrace whatever it takes to have a good time and have the attitude that it’s OK to bring a guy in a wheelchair out in Alaska to get a bear,” Johnson said. Cobb tried to treat Johnson and Malcom Kirkwood of Olympia, Wash., just like he would any other hunters, but he acknowledged it took more work. To start, Cobb had to remodel his lodge to make it handicapped accessible. He built a ramp to the front of the lodge, adjusted bed heights and redid the shower to make it easier for Johnson to get in and out. Transporting Johnson and his wheelchair into the field was the hardest part of the arrangement, Cobb said. ”Our terrain isn’t like the terrain in the Lower 48,” the veteran guide said. Cobb used four-wheelers with automatic transmissions so the two hunters didn’t have to shift. They were basically strapped onto the machines, the guide said. Johnson hunted from his wheelchair in a ground blind about five miles off the Elliott Highway. He shot the bear over a bait station from about 40 yards. ”I couldn’t believe how they had everything set up,” Johnson said. ”It was a dream. If I had known this was possible, I would have done it years ago.” Kirkwood, the other disabled hunter, has a degenerative brain disease that affects the nerves controlling his arms, legs and speech. He is restricted to using crutches or a wheelchair to get around. Kirkwood, 50, shot his bear from about 12 yards on the last night of his four-day hunt. ”It was pretty exciting,” Kirkwood said by phone from his Olympia home. Kirkwood has been hunting for almost 30 years and has hunted in Africa, Canada, Montana, Texas and California. He met Cobb at a trade show in San Francisco two and a half years ago and arranged the hunt in Alaska. Unlike Johnson, Kirkwood had never used a four-wheeler, but he came away impressed with how well the all-terrain vehicles worked. He drove about 50 miles in four days. ”That worked out really well,” he said. Both hunters had high praise for Cobb, who has been a big game guide on and off for the last 20 years. Cobb, meanwhile, was impressed with the fortitude displayed by both Johnson and Kirkwood. While he isn’t ready to cater strictly to handicapped hunters, Cobb said now that he has done it and seen that it can work, he will likely do it again. In fact, Cobb has a hunter in a wheelchair coming up for a moose hunt in September. ”It isn’t so much the demand, it’s giving the opportunity to those who do want it,” Cobb said. ”There are a lot of people out there like this that want to hunt in Alaska but don’t have the opportunity. One scene Cobb will always remember about the hunt was turning around to see Johnson driving a four-wheeler with a bear draped over his upside-down wheelchair on the back. ”I wish I had a picture,” Cobb said. ”It was hilarious.” For Johnson, just getting out in Alaska and being part of a hunting party was worth the cost of the hunt, which was several thousand dollars. I am reading Norma Cobbs book about their start and life at Lost Creek Ranch. It is great. Wish you all the luck. I just finished the same book and was mesmerized and could not put it down till I finished the whole thing…what a page turner. Naturally I wanted to find out more and stumbled on a Alaska State Trooper report that Lester Cobb died at his residence in 2009…how can this be?? Yet this article was written in 2011, is he in fact alive, or was the article a mis print of some sort. Just curious. Will look further. Please take a moment to view out website. I really enjoy these things and reading about them. No I am not handicapped i do appreciate the fact that the outdoors can bring people together to reach a goal and whether that is completed as planned it always works out in the end. New friends are made and memories will be shared for a lifetime and thats what its about. I love hunting and think we need more people like this! Great Job Cobb and Kirkwood! What a read “Arctic Homestead” could not put it down. Sorry to hear that Norma and Les split after all they went through together and not sure if Les is still living or not and what about Norma Cobb? I too just got thru reading Norma’s book. What ever happened to Norma? Does the family still own the ranch? Great book! Sorry to say..Les passed away. The Book is a good read..but you have to read between the lines. I had the opportunity of going to the Lost Ranch after reading the book. Nothing like putting the actual pictures in my mind on film and seeing the property in person. I think Norma lives in Cal. now. She was living in Arizona years ago. I also had the pleasure meeting Sid Cobb and he’s the one who took me to the ranch where we stayed. It’s a beautiful place.